Jim Carrey was recently on Norm MacDonald Live where he revealed that Tommy Lee Jones hated him when they were making Batman Forever together. 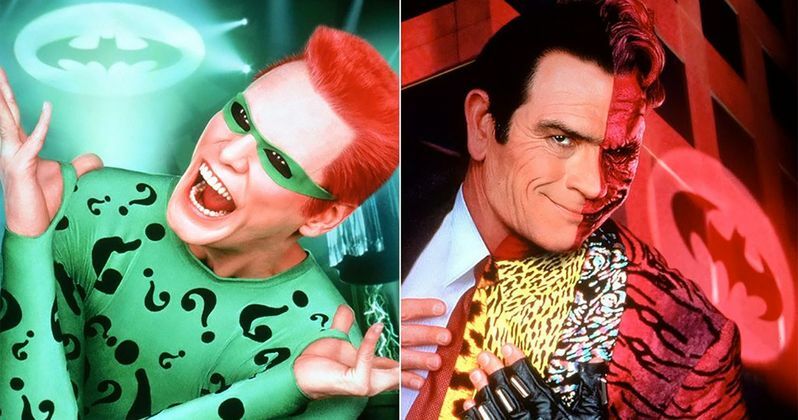 Carrey was playing the Riddler while Jones was playing Two-Face in the Joel Schumacher directed movie. The movie was seen as divisive after the Tim Burton movies with Michael Keaton starring as Batman, though it was not universally hated like the next installment in the franchise, which has definitely not aged well, so don't bother going back for a nostalgic viewing. Anyway, while Jim Carrey and Tommy Lee Jones were getting ready to do a scene together, Jones decided to tell Carrey about his true feelings. Jim Carrey has talked about the subject before in the past, but the subject came up again when Norm MacDonald asked him about it. Carrey maintains that he still has nothing but the utmost respect for Tommy Lee Jones, but went on to tell the tale again. Carrey explains. "The maître said, 'Oh, I hear you're working with Tommy Lee Jones. He's over in the corner having dinner.' I went over and I said, 'Hey Tommy, how are you doing?' and the blood just drained from his face. And he got up shaking-he must have been in mid-kill me fantasy or something like that. And he went to hug me and he said, 'I hate you. I really don't like you.' And I said, 'What's the problem?' and pulled up a chair, which probably wasn't smart. And he said, 'I cannot sanction your buffoonery.'" That's pretty harsh, but Carrey went on to say that it was more than likely that the whole reasoning behind it was that Carrey was the star of the movie and that possibly Jones was not entirely comfortable with the comic book material. Carrey had this to say. "I was the star and that was the problem. He's a phenomenal actor, though. I still love him. He might have been uncomfortable doing that work, too. That's not really his style of stuff." When Jim Carrey nonchalantly tells Norm MacDonald that he was the star of Batman Forever, he was not kidding. Carrey was on a roll after leaving the hit comedy sketch show In Living Color and becoming a bonafide movie star after the success of Ace Ventura: Pet Detective, The Mask, and Dumb and Dumber. All three of the aforementioned movies were released in 1994 and they launched Jim Carrey into the stratosphere and into a household name. Tommy Lee Jones, a serious actor, could have still been feeling the crushing defeat of Dumb and Dumber squashing his Cobb movie in 1994. In an interview with Howard Stern in 2014, Jim Carrey told the same story, but with a bit more detail about the whole Cobb vs. Dumb and Dumber box office fight. Carrey had this to say. "I think he was just a little freaked out because Dumb and Dumber came out on the same weekend as Cobb, and Cobb was his big swing for the fences and that didn't work out and that freaked him out a bit." On lighter note, at the end of the interview, Stern joked that Jones gave Dumb And Dumber To "zero stars and said "f$%k you." To which Carrey replied, "I hope Cobb 2 isn't coming out." It seems as if jealousy might have been the root of the problems on the set of Batman Forever, or it could just be that Tommy Lee Jones really just hates Jim Carrey and is pretty blunt about it. The rest of the Norm MacDonald YouTube interview with Jim Carrey continues the actor's WTF tour that he's been on lately and is a pretty interesting watch. Fans of the Carrey should definitely watch it as it's also pretty funny as well and a bit more lighthearted than some of the more recent Jim Carrey interviews. You can check out the full interview below, with the Batman Forever talk coming at the 1:08:30 mark.